Have you felt disappointed in your child? My son doesn’t want to go to uni. He doesn’t love learning. He doesn’t seem to apply himself to life in the way that I would so love him to. I’m disappointed, and I’ve told him so. But, I’m NOT disappointed in HIM, far from it, 100% of my disappointment comes from me and the mismatch between the son I had created in my imagination and the son I have before me. ONLY ONE OF THEM IS REAL. Here’s the thing, from the moment we become human we are creating scenarios in our minds about what could and what should be. From the moment we become parents we start dreaming of the family life we want, of what we want for our children and how they will ‘turn out’. And sometimes the contrast between what we want and what we are experiencing is pretty stark….but there’s gold in there when we look. Every contrast tells us what’s important to us: when we clearly see what we don’t want there’s also a huge arrow pointing to what we DO want…which gives us power to do something about it. Change what’s not working for you and take your power back, as we only get what we continue to choose to experience. You may feel that you have no choice but you do, we ALWAYS do. Sometimes the alternatives may seem that they aren’t worth considering as they seem soooo difficult or wrong, but these are still options, they are simply ones you’re choosing to say no to. That’s easy enough to say when it comes to things, but what about people? What can you DO if another human is the source of your frustration or disappointment? What can you DO if that human is your child? The thing is to know that THEY are not a disappointment because it’s an inside out job. 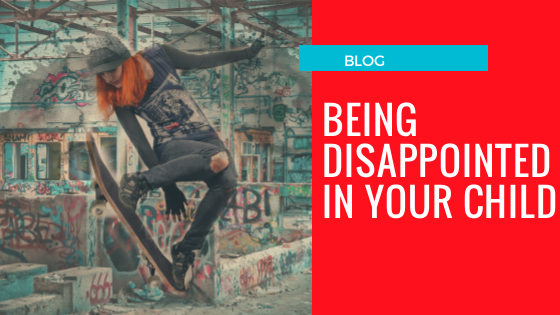 YOU are FEELING disappointed about the contrast between their choice of actions in reality and the picture you had created in your mind of what you want them to do and be. Does that difference make sense? Your child/young person/human needs to know that your love for them isn’t conditional on them choosing behaviours that support the picture that YOU have created in YOUR head of them. That’s YOUR story, not theirs. They are creators too so let them create their own story and live that…and learn from the consequences of their own actions. Teach them to trust themselves and own their own power, not to second guess what they ‘should’ be doing to be accepted and loved. The disappointment you feel simply reflects this contrast within you, so stop getting angry and frustrated with them and look within instead. What is it that YOU want that your deferring responsibility to your child for? What does your child’s choices and behaviours get for YOU? Stop looking for evidence of how your child doesn’t meet YOUR needs and start looking at THEM. Be curious as if they are a new person in front of you and get to know them as a human rather than your child. Of course you’re still the mammy or the daddy or whatever role you play and you have an amazing opportunity to influence them…and you WILL influence them whether deliberately or not and whether positively or not; so get clear about the influence you want to have, the impact you want to make on them and then BE that. Don’t do what I say, do what I do! Our young people are watching and learning from our every action so being YOUR best will encourage them to be THEIR best. Lead with love. Shine. Make your own story so compelling that they want to be a part of it. The son I have before me is gold, I love him with my heart and soul. I have made so many mistakes along the way and I will continue to do so and I own every one of them. Yes, I’ve felt disappointed and I’ve told him so….I’ve told him about the story I created in my head about who he is and what I’d love him to do and I’ve asked him what story he’s creating for his life. He doesn’t know yet, he’s not clear, he looks at me like it’s motivational mum time…again. I felt another twinge of disappointment that my first born doesn’t get nor care for his conscious creation (he’s 17 so feel free to laugh at my ridiculously high expectations!) So yes, I have felt disappointed in my child, that he isn’t living the life I had created in my imagination but oh my goodness how excited I am to discover the life is HE is creating in his. Does this resonate? I’d love to hear your experiences and thoughts in the comments below. Because I was “guided” in my choices by my well-intentioned mother and have ended up drifting from job to job because I didn’t get to pursue my passion, all we ever really put onto our own kids was “do what you love to do”. We are fortunate that they were determined to do that well, but the overriding thing was that it was their choice. But only from my own experience of not really choosing for myself! It’s funny how our passion never leaves us…it may be suppressed but it’s there, willing us to find ways to release it into the world! It’s still important for you to find that way to express yours….you’ve given your kids the gift of pursuing their passions and they’ll look to you again when they are adults as to how they can create what they want even when life seems to get in the way. I don’t believe our job has to be directly related to our passion…it’s how we infuse our passion in our life and work.